This book was written over the course of 1 year for a group of youth drummers (Montgomeryshire Youth Music Drumline) in Powys, Wales. I have compiled the year’s pieces into an ebook that can be used by other drum teacher, or by self taught drummers. The pieces are similar to Snare Drum Sheet Music style pieces, but with the added timbre of a floor tom. You can achieve quite an epic cinematic sound by combining the two drum voices in unison. Difficulty levels from Grade 1 to Grade 3-4. Drum teachers are completely free to print the book or single sheets for their students. Drummers that need to perform for school or competition etc. When you purchase the book, you will receive a .pdf file that you can keep and use forever. 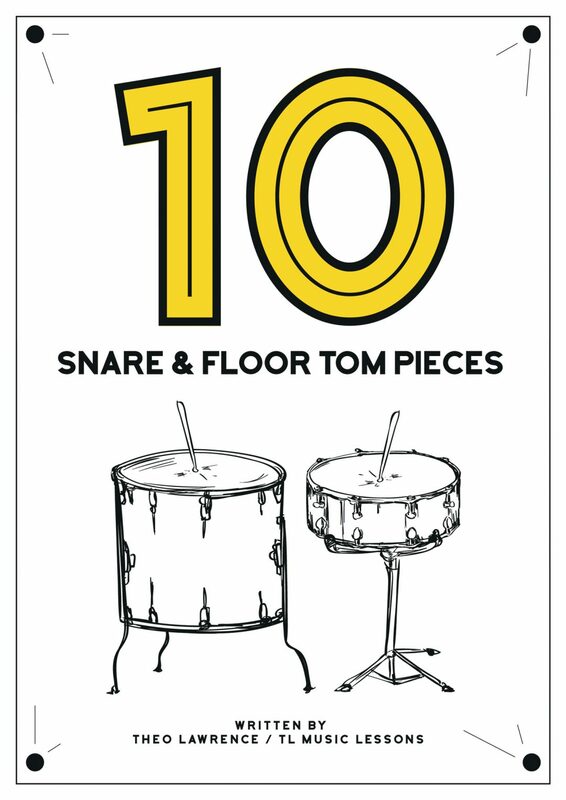 The 10 pieces are performance pieces for drums, with no backing. Drum groups, or individual drummers can perform these pieces. They have been written to sound good as standalone pieces – they are not just practice exercises. The pieces do not focus on many dynamics, but they do cover many techniques, rhythms and some rudiments, from quarter notes to sextuplets and triplets, and from flams to drags and buzz rolls. Some of the pieces have multiple parts, which may be played together. So, if your group has varying ability levels, some can play part 1, some part 2, and some part 3. Not all the pieces have 2 or 3 parts. Please check the contents page to match up the pieces. I have compiled the book in order of difficulty. The levels go from about grade 1 up to grade 3-4 level. Reading Tip: I developed the writing over the year. For pieces with two stave lines – the top line is the snare and the bottom line is the floor tom. This book is a follow on from “10 Snare Drum Pieces – Book 1”, written in 2015. That book was for snare drum only, and in the last 2 years has been purchased by 60 people from all around the world, many of which are teachers themselves who are using the book to teach their students or drum groups with. I hope this new ebook will inspire more groups of this type. I’m sure it’s not the first time it’s been done with groups of drummers, each playing a snare and floor tom, but I do think it is very rare to see it. I hope to inspire other groups to adopt this idea. I’m sure this won’t be the first and last book of it’s kind, because I intend to continue teaching the MYM Drumline for many years to come, and I will be writing new pieces for the group regularly.